The Food Alphabet and More: Buy 1 Take 1 Buffet Lunch at Cafe Eight in Crimson Hotel! 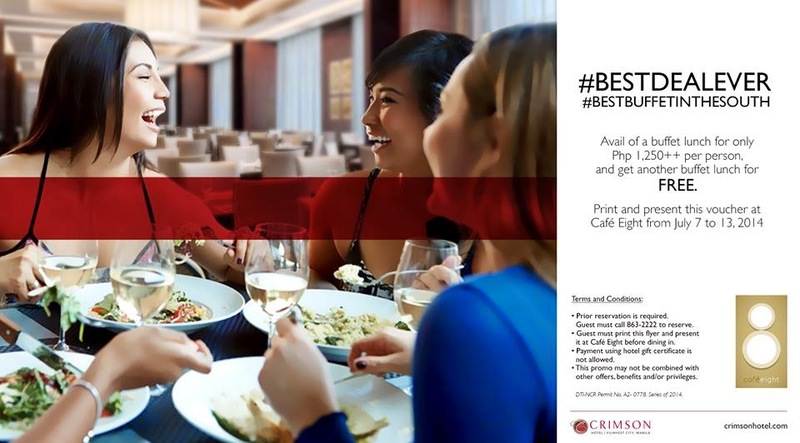 Buy 1 Take 1 Buffet Lunch at Cafe Eight in Crimson Hotel! Enjoy, indulge and dig in with lunchtime at Cafe Eight's newest deal! Dine with a friend for a price of one from July 7 to July 13, 2014 only. Simply print and present this e-voucher to avail of the discount. Prior reservations is advised. Call 863-2222 loc. 1612 for more inquiries. Following your Fashion-Jwelery site I am very happy ,You please follow us on:- If you are worried about the diamond price Singapore then there is nothing to worry for you in further cases. We are providing you the best quality of diamond directly from the manufacturer to provide you the best diamond price in the market. You can also look for Wholesale Diamond Singapore section in our website where you can buy a wide range products like necklace, pendant, diamond ring Singapore etc.